One of the most novel aspects of the Frontier Fields project is the innovative way in which the Hubble Space Telescope is being made more powerful — without adding a single piece of equipment or changing a single hardware component. While Hubble itself isn’t altered physically in any way to allow us to peer farther than we ever have into the universe, these observations wouldn’t be possible without one crucial component: dark matter. Frontier Fields is turbocharging Hubble by looking at the distant universe through gravitational lenses that boost the signal from the feeble light of remote galaxies, essentially making Hubble a more powerful telescope. For the amateur astronomers out there, these gravity lenses are like adding a Barlow lens to the eyepiece of Hubble. What creates these gravitational lenses? Matter, and lots of it. Thanks to the theory of general relativity, we know that space-time is warped by stars, planets, galaxies, black holes — anything with mass. The light bends as it travels through this warped space-time. In order to make a decent gravitational lens that will show you the most distant galaxies in the universe, you need lots of matter. Among the largest collections of matter in the universe are of galaxies. Hundreds of billions of stars all grouped together can bend a lot of space-time (and they do). What could be better? A lot of galaxies all grouped together, otherwise known as galaxy clusters. 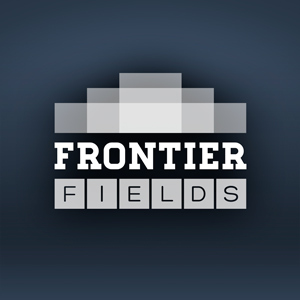 We’ve written before about the galaxy clusters that the Frontier Fields team will observe throughout the course of the survey. They were chosen because they made good gravitational lenses. But while the galaxies in these clusters do have lots of stars in them — hundreds of billions in each one — stars actually are not the major factor contributing to the bending of space-time around the clusters. The largest contributor to the creation of those gravitational lenses is something we can’t see, smell, taste, hear, touch or interact with in any way: dark matter. This stuff is all over the universe — in fact, there is five times more of it in the universe than there is ordinary matter. Everything we can see in the cosmos — stars, planets, comets, all life on Earth, anything that’s made up of atoms — constitutes roughly 5% of the total matter and energy in the universe. Dark matter makes up about 24%. The answer is simple enough. We know dark matter exists because we can see its effects on those things we can see. We were first tipped off to dark matter in the 1950’s by the motions of galaxies. We noticed that if we added all the mass of all the stars inside of galaxies, something wasn’t right. The galaxies didn’t rotate the way they should. Their motions suggested that something else had to be there mixed in all the stars we could see. What’s more, the galaxies that were gathered together into clusters were short on mass. If just the mass we could observe was all there was, the clusters would fly apart. There wasn’t enough observed mass to make them stay together. This stuff, whatever it was, was making galaxies rotate as if they had more matter than we could see and was also holding galaxy clusters together. In astronomy, we are used to investigating celestial objects by the light they emit, reflect, or block. We called this strange new discovery dark matter because it does not interact with light — though clearly it has a gravitational field we can detect. We’re starting to get pretty good at estimating where the dark matter is in galaxy clusters. We can even make maps of it. 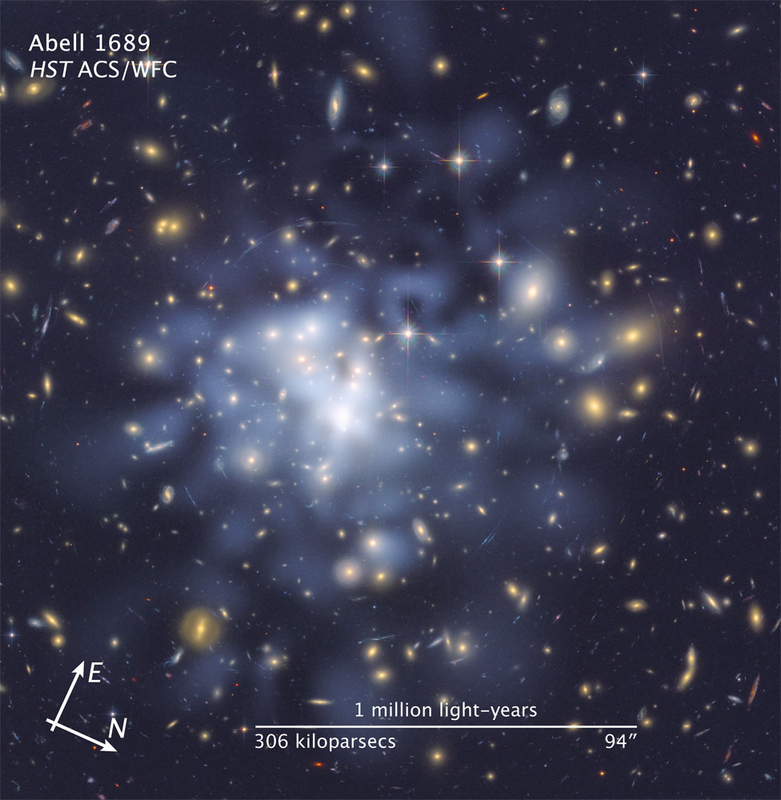 Here is a map of dark matter around the Abell 1689 cluster, home to thousands of galaxies and trillions of stars. 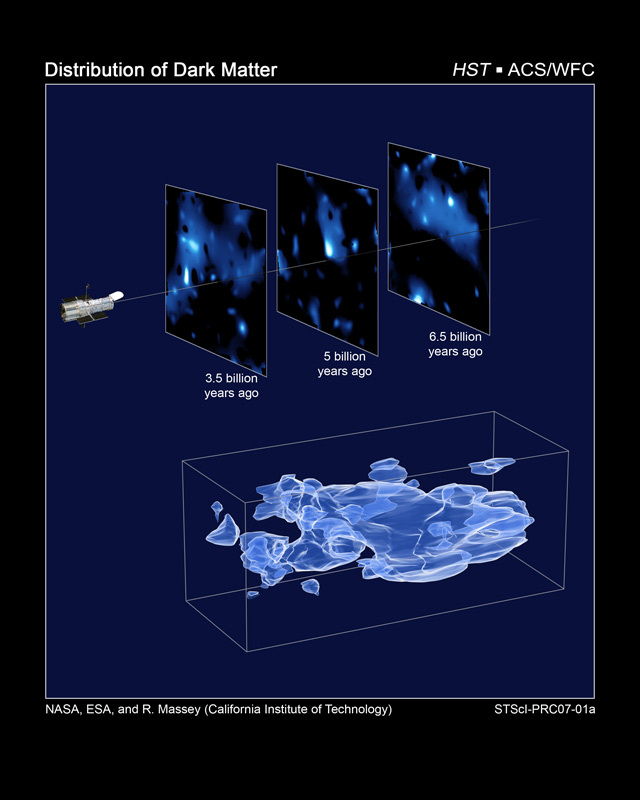 Astronomers have gone so far as to map where most of the dark matter is in the universe. Here’s a graphic showing the distribution of dark matter in the universe. Most astronomers believe that dark matter is concentrated in and around small clusters of galaxies. For the purposes of the Frontier Fields Survey, dark matter plays a crucial role. Without it, these galaxy clusters would have less mass, and space-time would bend less significantly, creating a weaker lens. By using these powerful natural lenses, the Frontier Fields project will enable Hubble to see galaxies about 10 times deeper than the Ultra Deep Field, the current record holder for the deepest image ever taken. And that corresponds to 40 billion times fainter than what the human eye can see. Now the next question you may be asking is, “What’s this dark matter stuff made of?” Astronomers are actively researching that question, but that’s a post for another day — so stay tuned! What do you believe is the Dark Matter “engine/machine” creator? What of all the large matter we see in our local universe could be the source of Dark Matter creation? At one point in time there was none, today everything we see is made of Dark Matter, will we, once we find the source, be able to figure out how in reality the universe became to be? and may be, do you believe this new theory, once of course found, would account for the needed fluctuations to produce the structures we see in our local universe? Is it also possible that the gravitational lenses we see could be created by several chemical and physics process? Is so, do we know the process? excuse my writing, English is my second language. The problem with Dark Matter is that it suggests an answer to the question that the gravitational behaviour of large galaxies and clusters of galaxies etc can not be explained by the sum of their gravity. I think Dark Matter should always be referred to as an unanswered question. We don’t know if it is matter nor that it is dark. The problem with Dark Matter is that it suggests an answer to the question that the gravitational behaviour of large galaxies and clusters of galaxies etc can not be explained by the sum of their gravity. We don’t even know if it is matter nor that it is dark. Perhaps there is some sort of exponential property within gravity (on very large scales) we haven’t discovered? 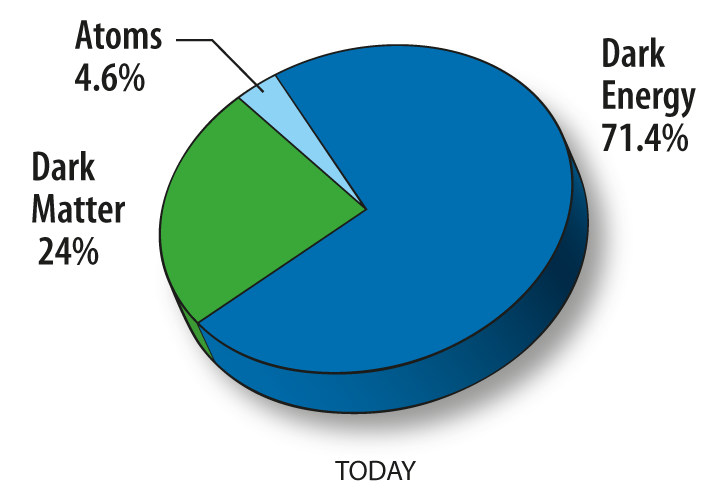 About 74% of this universe is not dark matter (~26%): dark energy ~69% + ordinary matter ~5%. 74% of the elemental mass of this universe is hydrogen. Unified Strings (U21 S19) Theory states that there are 7 dimensions of hyperspace + 4 common dimensions and 7 aspects of regular time + 4 aspects of hypertime. The ancients observed 7 moving objects in the heavens – the ‘7 Classical Planets’ – and 4 don’t cast shadows on Earth/4 can’t be easily seen during daytime. The 4 lunar phases are slightly over 7 days (~7.4 days) each varying due to apogee and perigee. Lunar year + 7 day week + 4 days = 365 day solar year. Mars returns to the same point against the background of stars and in relationship to Sun and Earth every 47 years. The Big Dipper is 7 stars with 4 in its quadrilateral ladle. Its 4th in the middle is its brightest. It points toward Polaris with is the end of the handle of the Little Dipper: again, 7 stars with 4 in its ladle. Polaris has been the North Star since around the fall of the Roman Empire in 476 AD. Venus is .7 AU and Mercury .4 AU. Besides Earth, this solar system has 7 planets with the largest Jupiter being 4th from the Sun. Out of these 7 planets, 4 are non-rocky gas or ice giants. Saturn has 4 ‘seasons’ each about 7 years long. Etc. This is known as the GOD=7_4 algorithm. See my tweaked NASA conference presentation at http://PlanetNestor.blogspot.com or a different version at http://GOD704.wikia.com .